In addition to being more likely to be diagnosed with prostate cancer, a new study suggests black men are more likely to die from low-grade prostate cancer. For African American men, the risk of dying from low-grade prostate cancer is double that of men of other races, a new study has found. But, despite the difference, the risk is still small. When a man is diagnosed with prostate cancer, the disease is given a grade, or score, based on how abnormal (or aggressive) the cancer cells look under a microscope. 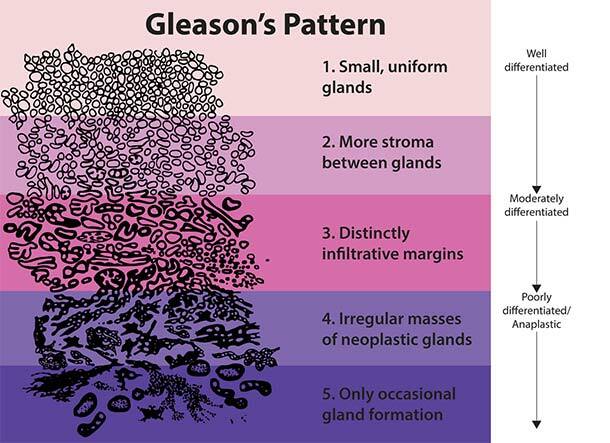 This system for assessing the aggressiveness of a prostate tumor is called the Gleason score. Prostate cancer with a Gleason score of 6 is considered low grade, meaning it is less likely to grow and spread than cancer with a higher score (7 to 10). The vast majority of men diagnosed with localized, low-grade prostate cancer will die of something other than prostate cancer. But, according to the new findings, doctors may be “underestimating the risk” of death from low-grade prostate cancer in African American men, said lead investigator Franklin Huang, M.D., Ph.D., of the University of California, San Francisco. The study findings, published December 18 in JAMA, are consistent with other reports that have identified racial differences in the biology and presentation of low-grade prostate cancer, said Howard Parnes, M.D., chief of the Prostate and Urologic Cancer Research Group in NCI’s Division of Cancer Prevention, who was not involved in the study. This body of evidence, Dr. Huang added, supports the idea that certain biological factors may make low-grade prostate cancer more likely to grow and spread in African American men than in men of other races. Do Prostate Cancer Disparities Differ by Grade? 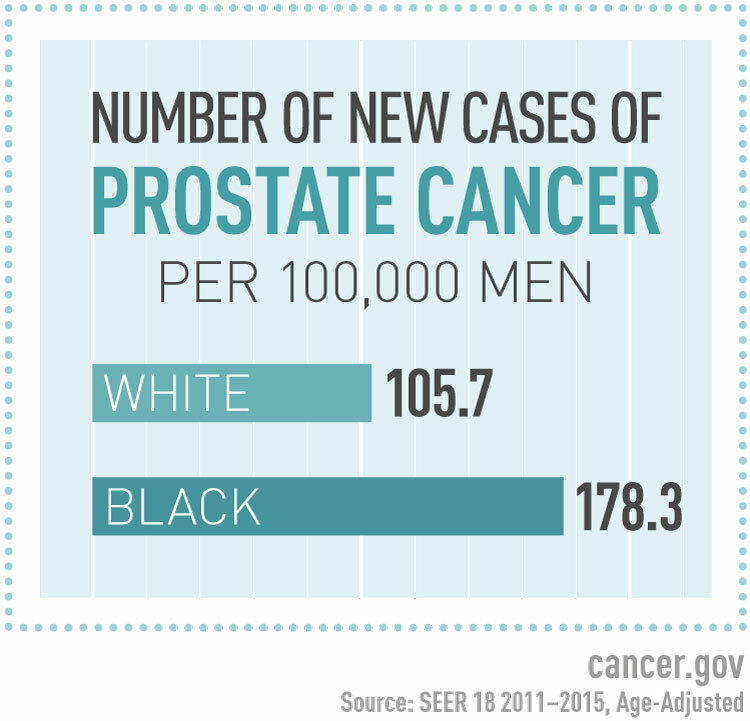 Compared with white men, African American men are more likely to develop prostate cancer and are twice as likely to die from the disease. But, before Dr. Huang’s study, it wasn’t clear if the disparity in prostate cancer death occurred equally across all disease grades or if it occurred mainly in one grade, he said. “It was a question that we were surprised hadn’t really been addressed,” he added. So, the researchers analyzed data from NCI’s Surveillance, Epidemiology, and End Results (SEER) program. First, they used a specialized SEER database containing information on more than 190,000 men with prostate cancer who underwent active surveillance, or watchful waiting, between 2010 and 2015. Patients were followed for a median of 3 years. Active surveillance is one of several options for the management of localized low-grade prostate cancer, as is immediate treatment with surgery or radiation. Each individual patient and his doctor should make that decision together, Dr. Huang explained. The specialized SEER database also includes information on socioeconomic status—a measurement of a person’s income, education, and occupation. Socioeconomic differences can lead to health disparities such as access to treatment. These data allowed the researchers to partially control for socioeconomic differences so that they could better observe possible associations between death rate and race/ethnicity. Their analysis doesn’t rule socioeconomic differences out entirely as an explanation for prostate cancer disparities, but it does do a better job than was previously possible, Dr. Huang said. Overall, few men in the specialized SEER database died from prostate cancer, they found. But there were differences by grade and race. In particular, African Americans were more likely to have died from low-grade prostate cancer than men of other races (0.40% versus 0.22%). By contrast, the rates of death from high-grade disease were similar among African Americans and of men of other races (1.44% versus 1.35%). The investigators found similar results when they analyzed data from the main SEER database, which includes information on more than 400,000 men with prostate cancer who were followed for a median of more than 5 years. In that analysis, a greater proportion of African American men than men of other races had died from low-grade prostate cancer 12 years after diagnosis (2.2% versus 1.4%). By comparison, the 12-year death rate from higher-grade prostate cancer was similar among African American men and men of other races (5.5% versus 5.3%). “We were surprised to find that disparities were greatest in low-grade disease,” Dr. Huang noted, because they had expected it to be similar across all grades. There may be variables that make low-grade prostate cancer grow and spread more quickly in African American men than in men of other races, but those features have yet to be defined and understood, Dr. Huang said. One possible variable is biological differences, such as genomic features of prostate tumors. In a separate study, Dr. Huang, along with Brandon Mahal, M.D., of Dana-Farber Cancer Institute, and their colleagues, explored this possibility using a test that estimates the risk of metastasis based on specific genomic characteristics of prostate tumors. In that study, more African American men with low-grade prostate cancer had tumor genomic characteristics linked to metastasis than white men. However, the researchers found that estimates of metastasis risk were similar among men with high-grade disease, regardless of race. These findings suggest that differences in tumor genomics may make low-grade prostate cancer more aggressive in African American men, Dr. Huang explained. Another possibility is that traditional biopsies may be more likely to miss areas of high-grade prostate cancer in African American men than in men of other racial/ethnic groups, leading to a higher likelihood of misdiagnosis of low-grade disease. A 2014 study found that African American men are more likely than white men to have tumors in the anterior region of the prostate, which is harder to reach with a traditional transrectal biopsy, Dr. Parnes explained. And at a follow-up biopsy or surgery, more African American men than men of other races are given a higher Gleason score than they were initially diagnosed with—what’s called upgrading. But advances in MRI technology have enhanced the ability to biopsy suspicious areas in the anterior prostate, reducing the chances that high-grade tumors in this part of the gland will be missed. “Anterior lesions can be picked up by image-guided biopsy much better than by standard biopsy,” Dr. Parnes noted. So, image-guided biopsies may help physicians catch high-grade prostate tumors in African American men. Although image-guided biopsies are becoming more common, they are not the standard of care and access may be limited, he added. Because low-grade prostate cancer has more aggressive features in African Americans, many physicians have questioned whether active surveillance is still an appropriate option for them. The findings from Dr. Huang’s study “don’t mean that African Americans shouldn’t be offered active surveillance,” Dr. Parnes stressed. Several other studies have shown that the outcomes of African American men with low-grade prostate cancer who underwent active surveillance are very good, he noted. However, these findings should be part of the conversation between patients and their doctors, Dr. Parnes said. As should the risks of treatment, he added. “I think overtreatment—actively treating people who may not benefit—is still the bigger problem,” he said. “The benefits of treatment are relatively small in men with low-risk prostate cancer and, therefore, we should take into account the potential harms of intervention, such as erectile dysfunction and bladder and bowel complications, before recommending surgery or radiation therapy to men with low-risk prostate cancer,” said Dr. Parnes.